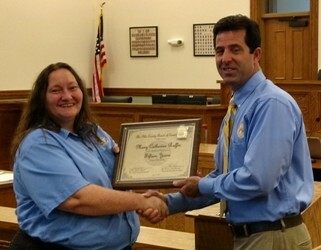 Cathy Ruffin was honored for 15 years of service with E911. Wednesday, June 13, 2018 – 9:00 a.m.
www.pikecoga.com/novusagenda has a download of the agenda and accompanying information for this meeting. This includes items listed on the agenda such as the Medical First Reponse License and the property being decided on Bottoms Road. Monthly information from Animal Control, Coroner, Fire Department, Grady, Library, Magistrate Court, McIntosh Trail CSB, Planning & Development, Registrar, Superior - Juvenile Court, Tax Assessor, and the Water Authority are included as well. Chairman Briar Johnson was present along with Commissioners Tim Daniel, Tim Guy, Tommy Powers and James Jenkins. Also present were County Manager John Hanson, County Attorney Rob Morton and County Clerk Jo Ann Wrye. a. Minutes of the Pike BOC 5-29-2018 Special Called Meeting. b. Minutes of the Pike BOC 5-29-2018 Regular Monthly Meeting. a. Employees to be recognized for years of service. Cathy Ruffin has been at 911 for 15 years. CM Hanson complimented her and thanked her for her service. Sheriff Jimmy Thomas also thanked Cathy for her service. When the emergency is called in, they dispatch every call in case it’s more than just a flat tire, etc. 911 working off of what they are told. He told her thank you for the job that you do! CM Hanson said that it’s been pretty hectic because of the rain and then permits and building inspections. The assistant and building inspector in Planning and Development have been working hard. There are a lot of things going on and filling the position in Planning and Development is on the agenda now. Working on some right of ways, ditching, culvert failures, and road crew has been very busy. He asked commissioners to let him know if there are areas that need to be addressed. McKinley Road had problems with the center of the road after zipping the road over a year ago after moving the debris that was found under the road. They had a company come in to check the road for a spring. The surface beneath was so inconsistent so they have no idea what has filled under the road. Probably have to remove another layer of dirt (one foot) to find out whether that will hold. They are waiting on a report before they finish this. From the County Manager Report that is given to commissioners prior to this meeting: "McKinley road work to determine the source of road failure is under way. Piedmont Geotechnical Service and NRCS ahve been on site and are working on reports to assist in the proper action to repair the road. Our crew asphalt zipped approximately 600 feet of both lanes to remody the asphalt 'chunk' issue. We intend on making all repairs with our crew upon receiving recommendations by the consultant. "End of CM written report. Tim Daniel talked about McKinley Road and said that he went out to see it when it happened. It happened overnight according to a property owner and the middle of the road had just erupted and was unsafe. He said that he appreciated the work of the Road Department to make it safe. Tim Guy said asked about shoulder work on Smyrna Church Road and other roads where we repaved the roads. CM Hanson will find out about it. Also potholes on Shortcut Road. A property owner has dug out a lake and has about 25 loads of dirt that the county can use if we are going to build up the shoulders on the roads. Chairman Johnson said that we get good reports from county departments, but that the county extension coordinator gave a great, detailed report this month. a. Approve/deny funds from Impact Fees and Capital Funds for the new Records/EMA facility. Brandon Rogers went through line item by line item. Prices have gone up a little but that was anticipated. $140,800 is the amount that is still anticipated to be needed. $30,000 from Impact Fees for the entire county. There is a little over $31,000 there now. $111,800 from Capital Funds. CM Hanson said that this is needed. As the need for paper records diminishes, we will still have to keep our paper records now. This building is an open style building that could be used for something else in the future and will also have use by EMA. Motion to approve. Approved 5-0.
a. Consider two appointments to West Georgia Region 4 EMS Council to fill a two-year term, set to expire June 30, 2020. Applicants have met criteria. Paul Beamon and Jim Totten are currently serving and recommended to continue. Motion to approve. Approved 5-0.
b. Consider three appointments to Pike County Recreation Authority to fill a three-year term, set to expire June 30, 2021. Applicants have met criteria. Joseph Walter, Kalum Alverson and James Landry. These are the only applicants and are reappointments. All have done a good job and are recommended for reappointment. Motion to approve. Approved 5-0.
c. Consider one appointment to Pike County Family and Children Services Board to fill a five-year term, set to expire June 30, 2023. Applicant has met criteria. Gina Earls. The applicant is here because this is a new appointment. Staff is recommending her appointment. d. Approve/deny to authorize Chairman Johnson to sign the contract between Three Rivers Regional Commission and Pike County to provide public transportation. This is already budgeted. Motion to approve. Approved 5-0.
e. Approve/deny road closure from County Farm Road to just north of Soccer Complex on Twin Oaks on June 30, 2018 from 2:00 p.m. until 11:00 p.m for the Pride of Pike event. f. Approve/deny to authorize Chairman Johnson to sign the contract for Indigent Defense Services in Pike County. This is budgeted. Motion to approve. Approved 5-0.
g. Approve/deny alcohol license (retail sale of beer and wine) for Thomas Jason Mask d/b/a Frank’s Filling Station, LLC. Applicant has met criteria. He has met the criteria. The background check hasn’t come back yet. CM Hanson asked for approval pending background check. Motion to approve pending clean background check. Approved 5-0.
h. Approve/deny to appoint Hofstader & Associates as the engineers for the CDBG process contingent upon approval of the grant from DCA. CDBG grant for Hilltop Community. We put out information as required. He asked that Hofstader & Associates to be our engineers if we receive the grant. a. Discussion of the future acquisition of real estate as provided by O.C.G.A. § 50-14-3(4), germane to Pike County Board of Commissioners. b. The Pike County Board of Commissioners requests consultation to discuss pending or potential litigation, settlement, claims, administrative proceedings, or other judicial actions brought or to be brought by or against the county or any officer or employee or in which the county or any officer or employee may be directly involved, as provided in O.C.G.A. §50-14-2(1), germane to Pike County Board of Commissioners. Motion to go into Executive Session #1. 9:30 a.m.
Back into session at 10:11 a.m.
CM Hanson consider authorization to join lawsuit on opioids. Motion to approve. Approved 5-0. Real Estate. CM Hanson recommended returning the property on Jonathons Roost Road that was donated in 2008 for building a fire station. It was not built there because a fire station was built nearby. Owner asked to deed back the property to the owners of Peachstate Aerodrome Airport in exchange for Impact Fee Credits that were given at that time for $39,000. Motion to deed back to the owner in exchange for Impact Fee credit of $39,000. Approved 5-0. County Manager Hanson stated based on discussion regarding real estate in Executive Session he would like to recommend returning the property that was originally part of the Peach State Aerodrome that was donated to the county in 2008 for a fire station. The fire station was built in a location nearby and the new owner of the Aerodrome asked if the county would consider deeding that property back to the Aerodrome in exchange for Impact Fee credits given at that time. The value of the property at that time was $39,000 and the credit for the Impact Fee at that time was $39,000. County Manager Hanson is requesting the property be deeded back to the Aerodrome in exchange for reduction in their Impact Fee of $39,000. Back into Executive Session. 10:14 a.m.
a. County Manager requests Executive Session for discussion or deliberation on the appointment, employment, compensation, hiring, disciplinary action or dismissal, or periodic evaluation or rating of a county officer or employee as provided in O.C.G.A. § 50-14-3(6) germane to interviews for Planning and Development Director. [Note from the Editor: The following is from the Post Agenda since this was basically a job interview. Motion/second by Commissioners Daniel/Powers to adjourn Regular Session and enter into Executive Session at 10:16 a.m., motion carried 5-0. Commissioner Jenkins was unavailable to go into the 2nd Executive Session due to previous commitment and Commissioner Daniel had to leave Executive Session early due to previous commitment. Motion/second by Commissioners Powers/Guy at 12:45 p.m. to adjourn Executive Session and enter into Regular Session, motion carried 3-0. Motion/second by Commissioners Guy/Powers to adjourn at 12:46, motion carried 3-0.